The recent magnitude 7.8 New Zealand South Island earthquake could end up costing the insurance and reinsurance industry as much as US$3.5 billion, according to risk modelling firm AIR Worldwide. The risk modeller is the first to offer an official insurance industry loss for the November 14th New Zealand earthquake, estimating that the eventual insured loss payout will range somewhere from NZ$1.15 billion (US$762 million) to as much as NZ$5.3 billion (US$3.5 billion). Most of the residential damage will be covered by government-backed insurance from the Earthquake Commission (EQC), which has a US$3.3 billion (NZ$4.7 billion) reinsurance program in place and is likely to call on it. Meanwhile, rating agency A.M. Best said that the earthquake will result in “material” losses for some New Zealand domestic insurers and that it expects the number of reported insurance claims will continue to increase, particularly with such large aftershocks occurring. The Insurance Council of New Zealand cites the total gross written premium of the general insurance industry in the country at around NZ$5.3 billion in 2015. Should insured losses from the earthquakes and aftershocks total hundreds of millions of dollars, A.M. Best said that this could mean a moderate impact to insurers gross claims experience, with insurers IAG and Vero particularly exposed due to the region affected. A.M. Best expects the majority of insurance claims will come from commercial property insurance policies, as well as domestic or residential insurance. The rating agency notes the damage suffered to many buildings in the capital Wellington’s business district and more than 600 claims recorded by the Earthquake Commission. Meanwhile, insurer IAG said that it has received over 700 claims from the New Zealand earthquake to date, which will use up its retention and deductible. On a net basis, after reinsurance, IAG estimates that the quake and the recent Mildura and trans-Tasman storm event will cost the insurer a combined $200m. For the majority of exposed insurers, reinsurance coverage is expected to lessen the claims burden, A.M. Best said. However, the adequacy of reinsurance coverage will be a factor, as will insurers’ gross exposure, deductibles and retention levels. A.M. Best said that it does not expect to take rating actions on any rated exposed companies in the near term, noting that changes to deductibles since the Canterbury quakes and a shift to sum insured policies for homeowners could lessen the impact. 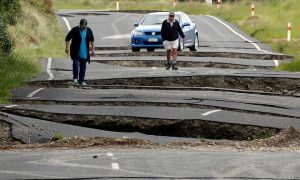 “High uncertainty” remains over the eventual size of an insurance and reinsurance industry loss from this New Zealand earthquake. But the initial estimate from AIR Worldwide gives an idea of the potential loss. Reinsurance capital will cover some of the damage, but to what extent at this stage is uncertain. Whether any ILS funds or collateralised retrocession providers could find themselves exposed is also unknown at this stage, but there is the potential for some ILS capital participation in reinsurance layers that are called on by impacted primary players. Aon Benfield’s Impact Forecasting unit pointed towards a US$1 billion plus industry loss, but did not provide anything more concrete at this stage. However the reinsurance brokers unit noted the expectation that losses would not come close to the 2010 and 2011 Canterbury region earthquakes, as Monday’s event was in a much more rural region and at a greater depth. The epicenter of the M7.8 earthquake was near the small tourist town of Kaikoura, which lies half way between Christchurch and the capital, Wellington. Kaikoura was cut off by landslides and lost its power, water supply, and sewage system. More than 134 buildings have been inspected in Kaikoura resulting in 13 red tags denoting unsafe for use as well as 39 yellow tags denoting restricted use. About 1,200 visitors and residents have been evacuated and a local state of emergency has been declared. The seabed in the area has been raised by up to two meters in places, likely impacting the local fishing industry. Christchurch appears to have experienced far less damage than it did in the devastating earthquakes that struck the area in late 2010 and early 2011, but has not escaped unscathed. Damage in the Canterbury area may account for up to 30% of the total losses. According to AIR, much of the region impacted by the November 14 event is rural and sparsely populated, but significant damage accounting for at least half of the losses from this event is reported in Wellington on the southern tip of North Island. Throughout the impacted region, glass has been broken in buildings, chimneys have collapsed, and some structural damage has occurred. Building contents breakage has occurred widely, and power outages, disruption of water and sewer services, and interruption of phone service are reported. Some highways and rail lines in the affected region have been damaged, and many bridges and tunnels were closed after the initial quake pending inspection. In Wellington some multi-story buildings experienced broken windows and contents damage, and the capital initially appeared to have escaped serious loss. Inspections, however, raised concerns about 60 or so buildings in the center. While parts of the central business district have been cordoned off because of damage to buildings, there is no “Red Zone” like the 859-day exclusion zone controversially established five years ago in Christchurch. According to AIR, much of the central business district and waterfront of New Zealand’s capital is underlain by soft sediments, which amplify ground shaking and liquefaction damage has been reported there and on the Picton foreshore. Port operations have been suspended until further notice by CentrePort because of shake and liquefaction damage to buildings and facilities. Demand surge—the increase in costs of materials, services, and labor due to increased demand following a catastrophic event—although not triggered by this event.